Tagged under Eiichiro Oda, Toei Animation, Series. One Piece, the treasure of a lifetime, is being sought by every pirate in the seven seas. One boy's dream is to find that treasure and to become King of the Pirates. That boy is Monkey D. Luffy, and with his rag-tag crew he will sail the Grand Line searching for a treasure that will make any pirate's dream come true. Yes, I do agree that OP is not a bit realistic at all. However, after a long day's struggle at work or school, it's time to just sit back, watch the show, and relax. Don't think about anything, don't worry about anything, just enjoy. At least what OP offers is a bit of an escape from this complicated world, and a bit of a reminder of all the wonderful things on this world. OP is suitable for humans across the age, however parents must be aware of the revealing clothes that some of the female characters wear. Even though there are violence and blood I feel that the violence level is pretty much same as Tom and Jerry. Thus OP is highly recommended for those seeking a bit of fun. p/s: Do not worry about OP having so many episodes and having to start from the first. I'm soo mad how long and this anime is so freaken long. I just started like a month ago. That why I put partially because I can't middle of the anime. I have 3 favorite character is Luffy...not because he is the main character. My second is Zoro because he's awsome no matter what anyone says and i mean ANYONE. And my last one is Ace because he one of the best characters in one piece to me. I'm going to put Luffy's Pirates to best to worst. 1.Luffy, 2.Zoro, 3.Nami, 4.Nico, 5.Brooke, 6.Frank, 7.Chopper, and the worst is Usopp or something like that. I truely hate Usopp, I would love it Luffy Bazooka him off earth. 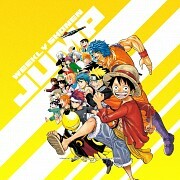 Have read all of the One Piece manga and only watched a few of the films (Strong World, Z and a few others). The manga is in a class all of its own. The story and characters all develop nicely. We get to see such a large variety of the different places of the world, which are tied in and mentioned later on (not just forgotten). There is a rich history of characters and events to draw from that continue to evolve as the manga progresses. More prequel/history of the manga (such as Whitebeard, Gol D. Roger, Shiki the Golden Lion and others in their younger days) would be fun to see. 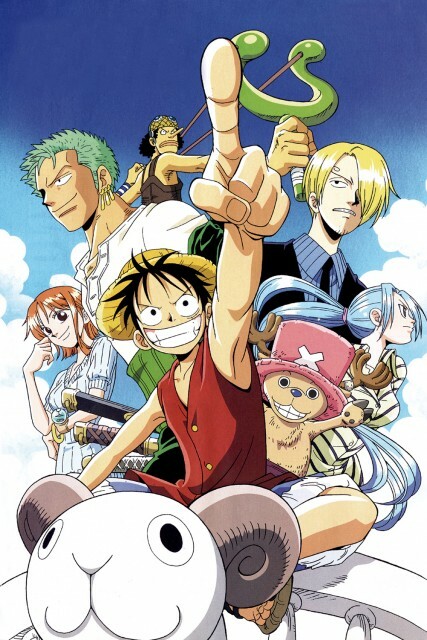 It's hella long..... but I enjoy it; this whimsical comedy adventure is hilarious but has it's serious moments and revolves on the concept of one's Dreams and Nakama (and to Luffy-chan food as well) it is highly based on what is right and wrong even though the Straw-hat pirates are constantly contradicting this, in the end it's all about watching each crew member attain their dream and watch Luffy-chan fight and eat his way to become the pirate king, but of course this story is not all fun and games it portrays the saddens and the difficulties of fighting against all odds, manga or anime it's both good so take a peek. A 7 year-old Male, named Monkey D. Luffy, ate the Gomu Gomu No Mi fruit to become a Rubber Man. Years later he decides to become a pirate and forms his own team little by little. Luffy's dream is to travel to One Piece and become the Pirate King. Currently watching this. There are definitely hilarious moments here in this Anime. This is best watched subbed. That's just my opinion. The comedy is kept fresh if you do watch it subbed or Raw (as long as you know Japanese). Dubs just doesn't do it...for me at least. This anime is my favorite anime that still ongoing and I'm still watching it since the series is not finished yet. This is the anime series that enlightens my mood. The plot is so light and there are mixed emotions including comedy and actions.. I really enjoy watching this anime, it makes me happy and at the same time I feel entertained. I have watched this anime long time and it makes me addicted into it. ONE PIECE is the best anime series I have seen so far, does not have the most eye-catching graphics, also has some parts do not quite measure up, but the male romanticism, the humor, the same world created by Oda and the charisma of Monkey D. Luffy and the crew of his band is what makes this anime fill my life with excitement and make me feel like a kid again. I have seen all the material available on the web until today, including TV series, all movies, short films, specials and OVAs. One Piece is a unique series, the idea of pirates with superpowers is very original. It's entertaining to watch but I must say it has a very long story, too many characters and episodes, but the plot is very nice and the main characters are well developed. I'm not a fan of the art style, the backgrounds are often quite plain and quickly done, though I admit the animation is quite good. My friend told me about One Piece and one day she invited me over to her house and we watched One Piece with her brother non-stop for a week and a half. We only left the room to sleep, shower, went to the shop and eat - and even sometimes ate in front of the PC. Got thru over 200 episodes ... I was hooked. And in no time I spread the word on One Piece and got over 5 friends to start watching it! A wonderful shounen anime about friends, adventure, fighting for what you cherish and dreams. At over 570 episodes, 12 movies and still going strong, this is one of the longest running popular anime out there. Don't be discouraged about the amount of episodes, I promise it's well worth the watch. This anime deserves all it's good remarks. The art may not be that detailed in a sense that some are basically not realistic(what do expect in a nonfiction). Overall the huge sense of humor combined with action and the importance of a comrades, thumbs up! This show was really good. I followed this show for quite sometime before losing intrest in it. After awhile it stopped grabbing my attention and began to bore me. I might watch it again and see wht I have missed, but idk. The show over all was pretty good. A great story with wonderful characters and well thought out story arcs. Each character has growth in their own way and we grow to love and respect them. As with all Manga/Animes the only fault I can find is sometimes the exposition of certain details as well as the elongated times for something to happen, but that is with all mangas and with this one in particular it is a well told and deep emotional story. Shonen entre shonen, uno de los tres grandes titanes y, como es de esperarse, una gran serie, que te deja pegado a la pantalla..¿Conseguiran los miembros de la tripulacion cumplir sus sueños? ¿Conseguiran el One Piece? One Piece attract so many anime lovers due to its uniqueness, plot of the story and how the story unfolds.The artwork is far from the usual anime series, at first you might feel awkwardness of the artwork but when you finally got plot of story you will never that you are already hooked with series. The story itself has a unexpected twist from time to time that will kept you guessing on what will happen next. Comedy, action, adventure, drama and etc. are balanced well that makes the fans wait with excitement for the chapter/episode to come out, unlike other anime that are being commercialized (prolonged story-line/dragging story-line) to gain more money that excitement of the fans are slowly fading out.